With Email Sender Deluxe, sending out personalized bulk email and newsletters to your customers and clients just got a whole lot easier! Simply choose your recipients, write your email and hit Send! You can easily import recipients from databases, Excel, text files or enter them manually. You can store email templates, so you don't have to type the whole newsletter again the next time you send one. If you send out newsletters regularly or need to notify your customers about new products and services, Email Sender Deluxe is here to help you. - Send personalized emails quickly! - Preview all emails before they are sent. - Insert both embedded images and images that are linked to. - Send file attachments to all recipients. 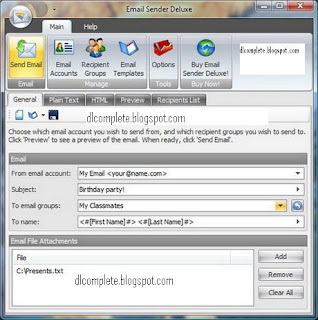 - Send both plain text and HTML versions of the email. - Use multiple email encodings such as languages and standards. - Send using multiple connections for maximum speed. - Automatically retry failed emails. - Update latest recipients from databases and files automatically. - Send using SMTP server, Direct Send (DNS) or Pickup Service. - Easily manage "from" accounts, recipient groups and email templates.